You get a free surprise gift tucked into every order. And you don't have to do anything- it's automatically added to your cart. But don't forget to complete the checkout- it's the only way you'll get your FREE GIFT! Order from us and you'll get your order in a couple of days! You pay only $5.99 shipping for ANY order! Most packages cost us between $8 and $20 to ship- but you'll pay only $5.99 and you'll get your package FAST! BEWARE: other stores may offer "free" shipping, but they use the economy SLOW methods, not Priority Mail or First Class Mail, like we do. We don't skimp when it comes to our customers! Don't wait and wait for your order to arrive- order from MagicTricks.com for SPEEDY service! *Please note: Orders over $15 are shipped via Priority Mail. If your order includes only items that are offered with "free shipping" , OR if your order totals under $15, your package will be shipped via U.S. First Class mail. First Class Mail is STILL SPEEDY- you'll still get your order in a couple of days! Learn tricks, improve your skills, get valuable tips and techniques! Some of the tricks in our store are BOGO- Buy One, Get One. That means if you buy a particular trick we've marked as BOGO, you get another trick we've selected- FREE! Our special customers receive special discounts and offers. How can YOU get the discounts, too? Follow us on Facebook, sign up for our newsletter, and more! If you buy it at MagicTricks.com, we've got your back! Aren't sure how to work your new trick? Want a free routine to use when performing? No problem! Just give me (Peter Monticup) a call at 540-832-0900, or contact me and you'll get all the support you need- free! Need recommendations on what to buy? We have a comprehensive guide that makes it easy to choose the right trick. Also, on each product page, there are suggestions for similar products. You can watch us demonstrate each trick on video. Or, of course, just give me (Peter Monticup) a call at 540-832-0900, or contact me and you'll get personal attention- free! Need some advice on a routine for your trick? Want expert help in putting your show together? Have a special show coming up, and you want to do something different? Just give me (Peter Monticup) a call at 540-832-0900, or contact me and you'll get one-on-one consultation- free! Or learn the real names of famous magicians, the true record holders in magic, the magician who helped win a World War- and more! Thousands of biographies of magicians of the past, including many rare photographs. Take a look at the Magic Library! 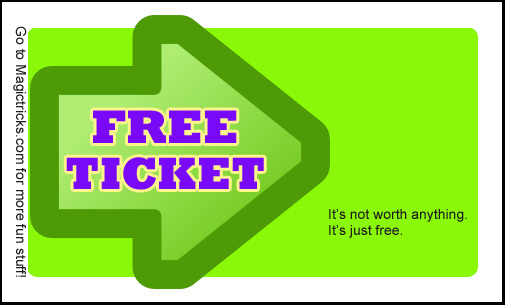 Here's a free ticket you can print and give out.